Our Society is very concerned about conservation of the veld. There are many forces at work to destroy habitat for the plants and animals that live there. Certain farming techniques, building of human habitations, road building and illegal collection of rare specimens are contributing to the gradual decline of the plants that we care for. In particular, there are a number of plants, that because of their limited numbers are considered to be rare and endangered. 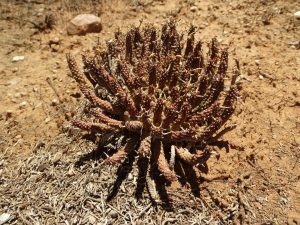 One of them is Euphorbia gamkensis, which is found exclusively near Calitzdorp. The range of distribution for this plant is extremely limited and for that reason there is a chance that any disruption in the current habitat will weigh heavily on the chances for its continued existence. We have contacted the owners of a field in the Calitzdorp area with the proposal that we might protect a number (more than 100 individual plants in the field) by fencing them in. At this time, negotiations for the fencing are under way. We will add more to this bulletin when we are closer to having the project complete.